@ SAC (ISRO), Department of Space, Government of India, Ahmedabad. @ BISAG (formerly, RESECO), DST - Gujarat, Gandhinagar. J. S. Bhatt and M. V. Joshi, "Regularization in Hyperspectral Unmixing", Spotlight Author Series in Digital Photography, SPIE Press, 2016, USA. 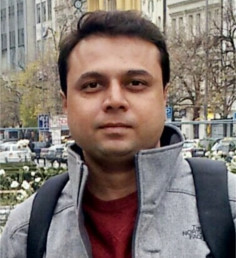 M. S. Raval, Vaibhav Joshi, and J. S. Bhatt, "Securing biometrics using data hiding techniques", in "Cryptographic and information security approaches for images and videos", CRC Press, Jan' 2018 (to appear). Jignesh Patel, M. V. Joshi, and Jignesh S. Bhatt, "Abundance Estimation using Discontinuity Preserving and Sparsity-induced Priors", IEEE Journal of Selected Topics in Applied Earth Observations and Remote Sensing, To appear, 2019. Jignesh S. Bhatt and N. Padmanabhan, "Automatic data registration of geostationary payloads for meteorological applications at ISRO", arXiv:1805.08706 [cs.CV], 2018. J. S. Bhatt, M. V. Joshi, and M. S. Raval, "A data-driven stochastic approach for unmixing hyperspectral data", IEEE Journal of Selected Topics in Applied Earth Observations and Remote Sensing (Impact factor 3.026), Vol. 7, No. 6, pp. 1936-1946, 2014. Jignesh S. Bhatt, M. V. Joshi, and Vijayashekhar S.S., "A multitemporal linear spectral unmixing: An iterative approach accounting for abundance variations", 9th IEEE Workshop on Hyperspectral Image and Signal Processing : Evolution in Remote Sensing 2018 (WHISPERS2018), (accepted), 23-26 September 2018 (Amsterdam, The Natherlands). Jignesh Patel, M. V. Joshi, and Jignesh S. Bhatt, " A novel approach for abundance estimation using discontinuity preserving prior ", IEEE International Geoscience and Remote Sensing Symposium 2018 (IGARSS2018), pp. 6171-6174, July 2018 (Valencia, Spain). Manu Sharma, J. S. Bhatt, and M. V. Joshi, "Early detection of lung cancer from CT images: Nodule segmentation and classification using deep learning", Proc. SPIE 10696, The 10th International Conference on Machine Vision (ICMV2017), 106960W, November 13-15, 2017 (Vienna, Austria). J. S. Bhatt, M. V. Joshi and M. S. Raval, "A regularization based method for spectral unmixing of imaging spectrometer data", Proc. of SPIE (H-index 90), Image and Signal Processing for Remote Sensing XVIII, vol. 8537, pp. 85370J1-7, 2012 (Edinburgh - UK). J. S. Bhatt, M. V. Joshi and M. S. Raval, "A parametric statistical model over spectral space for the unmixing of imaging spectrometer data", Proc. of SPIE (H-index 90), Image and Signal Processing for Remote Sensing XVIII, vol. 8537, pp. 85371J1-7, 2012 (Edinburgh - UK).